Huawei tooted its own horn today, gallivanting about all its 4G LTE network and hardware achievements as a relatively young company. While the company made some fairly arrogant statements during the press conference it put action behind its words the by announcing the Ascend Mate 2 4G. More than a slight improvement on the last year's Ascend Mate, the Chinese phone upstart positioned its 6.1-inch phablet as a direct competitor against the big boys, including the iPhone 5S and Samsung Galaxy S4. Is Huawei biting off more than it can chew when it's going directly after Apple and Samsung, or does the Ascend Mate 2 4G truly live up to its promise? Find out in our Hands-on Review. The Ascend Mate 2 4G is just as big as it's predecessor with a jacket pocket stretching 6.1-inch screen. While the screen remains just as oversized, Huawei trimmed the fat along the edges making it easier for our thumbs to reach across the display. The side edges on the Ascend Mate 2 4G barely extend more than 3mm from the edge of the screen. What's more Huawei also took off a bit of chin making the bottom stick just 10.5mm out. Overall the liposuction done to the Mate 2 makes the device feel very tight. There's not excess to the device other than the screen and its even 9.5mm thin. In the hand Huawei's new phablet feels more like light, yet thick slate of glass. The only thing that's not big about the Mate 2's screen is the 720p resolution. It's certainly not the highest on the market, but the phone's interface still looks sharp and the images we took looked great too. We also didn't run into any depreciative lag even with the Mate 2 running on a slightly aged Qualcomm quad-core 1.6Ghz Snapdragon 600 processor. Popping apps in Android Jelly Bean was still quick and snappy. The Ascend Mate 2 4G's other big upgrade was the 5-megapixel front camera. Putting more than a bump in resolution, Huawei also introduced a new selfie concept, panoramic selfies. Just like turning the camera to get a wide landscape, we did the same with the front camera to get a slightly bigger group picture of ourselves. Similar to the Google Photo Sphere, the camera app guides the user on how to move the camera to take the next image. In a final bit of self-glamorizing, the default camera app adds a bit of "auto face enhancement." Yes, that's the real name of the feature. Unfortunate marketing aside, the automatic filter essentially post processes photos to have better saturation and tone down highlights that might come off of users rocking the bald look. The back camera also takes auto face enhancement capable photos with a 13-megapixel sensor. 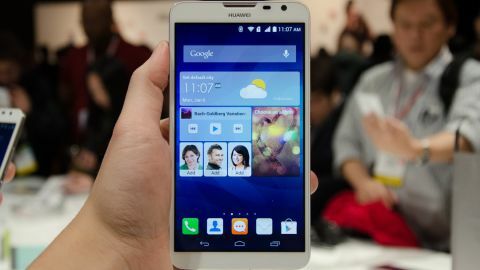 The Huawei Ascend Mate 2 4G is a big phone, there's no way look past it, but size isn't the only that makes it special. With a much tighter screen-to-body it's a completely useable with just one hand. With some new better selfies taking features and a large 4050mAh battery-life, that Huawei also used to take a swing at the Samsung Galaxy Note 3, the Ascend Mate 2 4G definitely falls into the notable category from our initial impressions. We'll have to reserve our judgment on whether the phablet is a winner for our final review but Huawei could have something big on its hands.